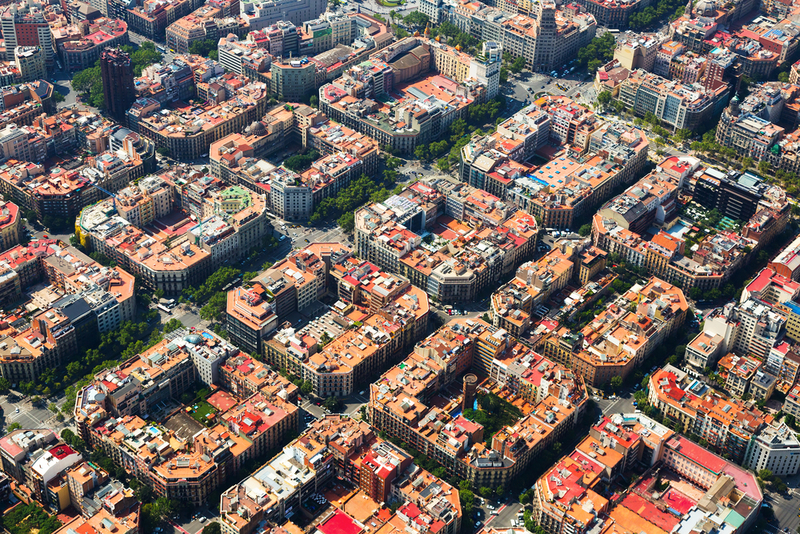 As with many other cities, Barcelona faces many problems, including a lack of green space, high levels of pollution and ever-increasing traffic. Its solution potentially provides a way forward for cities facing similar problems. Since Mayor Ada Colau came into office in 2015, she has developed the city's transport policy around large-scale city pedestrianisation (using Barcelona’s historic plan as a vision), with a goal to reduce private car and moped use by 21%. The ‘cutting edge of urban design’ concept developed across the Catalonian capital is known as ‘Superblocks’, which are 40-acre, pedestrian-first environments. The superblock is not a completely new idea; in 1993 the first large pedestrianised area was situated in the El Born district of the city. However, Colau’s intention is much more extensive this time, with the ultimate aim being to have some 500 superblocks covering practically the whole of Barcelona. The Poblenou superblock, which was developed in 2016, is the first of the current set of street ‘interventions’. It was previously an industrial neighbourhood and is now home to working-class families and artists; it used to have multiple lanes for motorised traffic around every block. As a result of the 'superblock' redesign, each of the blocks in the superblock are now surrounded by a single lane for motorised transport without a grade separation. Cars are directed at low speed around the perimeter of the superblock, which is three blocks across and three blocks wide. The remaining space is dedicated to cyclists, pedestrians and children, with bike lanes, playground equipment, open paths, trees, sculptures and street furniture. Replicating this vision across the city will not be easy. The Poblenou project was not universally popular, with some residents protesting against the traffic restrictions; only a handful of new superblocks have been developed since Poblenou. The gentrifiying baggage that ‘green redevelopment’ projects can bring is also a worry to some Barcelonans, but in Poblenau the superblock is positioned amongst towers of subsidised housing, which therefore reduces these pressures. According to Carles Peña, a member of the superblock advocacy group Col.lectiu Superilla Poblenou, the superblock has caused the neighbourhood to be transformed. He stated, “It’s a slower rhythm of life, and you rediscover your area and your neighbours.” The visual effect that is created, with long, linked corridors of multiple public space is surreal. The reasoning behind the superblock is that, whilst cars can enter the area, the people come first (which is different to a small park or pedestrian mall which are still surroundedby motorised traffic). Other cities are therefore watching Barcelona with great interest. Click here to see the short documentary from Streetfilms that provides an intimate glimpse into the Poblenou superblock. Image source: © Iakov Filimonov/ Shutterstock.com - no permission to re-use image(s) without separate licence from Shutterstock.